Spring is here and with warmer weather means we need to kick up our water consumption. It definitely takes some training to properly consume the right amount of water. I used to try and drink enough, but I never hit my quota. It's so hard to consume 8-10 glasses of water a day, especially when there are tastier drinks like coffee, tea, and my fave La Croix! But good skincare is the base of good makeup, and water is KEY to that. Water hydrates our skin, making it full and bright, thus diminishing the appearance of wrinkles. It also flushes out toxins, which can help to clear acne, and flushes out environmental stressors. Drinking more water has other great benefits besides just with the appearance of our skin - it keeps us feeling full longer, which is great for those looking to lose weight or to prevent yourself from eating that entire combo from the drive thru. Like I said before, there are better tasting beverages than water, soooo to get myself into the habit of drinking more water I started mixing in fruits and herbs. It was incredible how easy it was to drink more water!!! Adding fruits and herbs to your water is just enough to trick your mind into thinking you aren't drinking water. Plus, fruits and herbs are packed with essential nutrients for your skin, so don't stray from eating those garnishes. For the mommies out there, my kids are a huge fan of it too, so have them give it a go!!! If you use a clear bottle, it will keep them entertained and give them a boost towards eating their daily dose of fruit and water! Citrus & Mint - For this one I love to use grapefruit, cucumber, mint, and lemon! Lavender & Lemon - Try it without the simple syrup for a healthier "Lavender Lemonade"
The options are endless! Try mixing in different fruits and herbs!! Only about 20% of the fruits flavor and nutrients are released, leaving a light hint of each item you have chosen. Get creative! 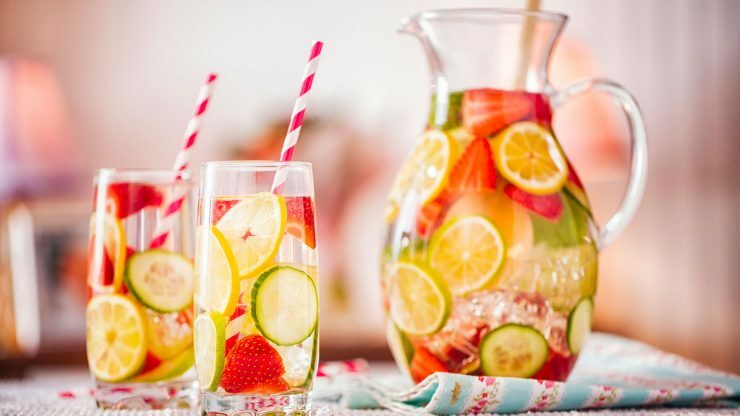 I am always looking for new flavors to add to my water, so comment below with your favorite recipes! I would love to hear them!